We design and supply high quality sterilizing equipment that are used for sterilizing medical equipment and instruments. Available in variety of designs and size specifications, our sterilizers have been designed as per the industry standards and can be availed at most reasonable prices. We manufacture Autoclave which is used for Sterilizing applications in medical industry. This autoclave is designed to work under high temperatures. 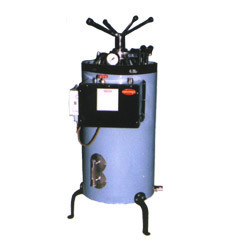 This auto clave is made from stainless steel 316 solid bar stock. They have fast opening system & also have all standard accessories and complete unit is mounted on trolley. They can also be made as per the technical details provided by the client. Looking for Sterilizing Equipment ?